1. It is my singular honour to welcome you all to this year’s SONIFES Media Briefing. 2. Perhaps I should start by restating that the Songs of Nigeria Festival (SONIFES) idea was conceived primarily to preserve the uniqueness of Nigerian music by promoting the local content of contemporary Nigerian songs in a world that has since become a global village. 3. For us at SONIFES, it is the strong native flavour of our songs that would enable Nigeria’s thriving music industry remain globally competitive in the long run. Remove the native flavour, you would have stripped it of its intrinsic value and left it vulnerable to undue western influence. 4. As it’s customary with us, we would like to pay tribute to the pioneer president and vice president of SONIFES respectively, His Excellency, late Chief (Amb) Segun Olusola OFR and Nigeria’s Lady of Songs, Chief (Mrs) Christy Essien-Igbokwe MFR. 5. Our sincere gratitude also goes to other past presidents: late Alhaji (Dr) Maitama Sule CFR, Prof. Emmanuel Dandaura, Gen. IBM Haruna OFR as well as Prof. Ahmend Yerima and Malam Yakubu Ibn Mohammed both of whom selflessly functioned as Chairman of the Advisory Board and National Coordinator for the maiden edition of the festival in 2009. 6. That said, we are pleased to respectfully invite you to the 2018 edition of SONIFES which has been scheduled for 5:00pm on Thursday, May 24, 2018 at the International Conference Centre, Abuja with the theme: “HARNESSING THE BEAUTY OF OUR DIVERSITY”. 7. The theme for this year’s edition - HARNESSING THE BEAUTY OF OUR DIVERSITY – captures the essence of the festival. 8. We believe that at a time like this, all patriotic Nigerians – individuals, groups and corporate citizens have a duty to deploy all tools and platforms available to them for the urgent task of national healing, by optimizing the abundant benefits of our diversity. 9. 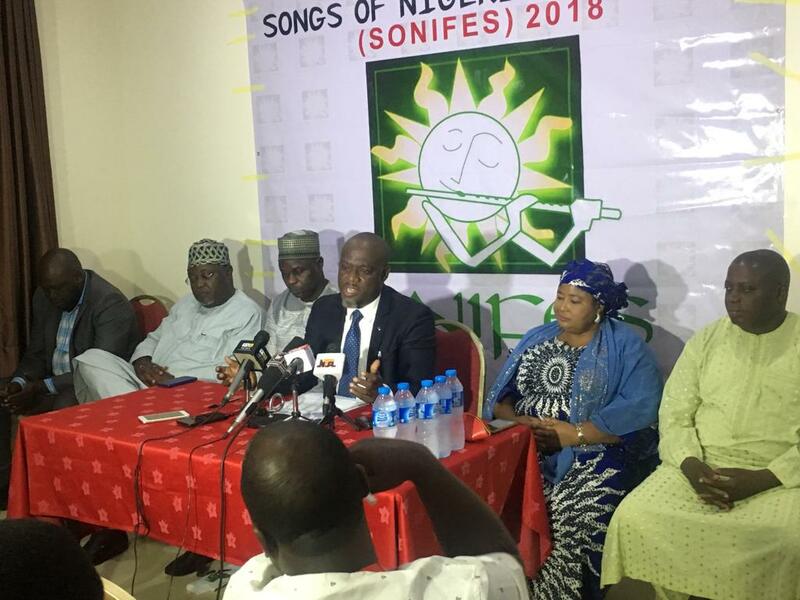 With SONIFES 2018, we aspire to sensitize the public on the need for non-state actors across religious, political, ethnic and cultural divides to effectively complement Federal Government’s efforts at stabilizing the nation; for it has become obvious that we cannot continue to ENFORCE national unity. A more desirable, more rewarding option is for us to begin to PROMOTE (as against ENFORCE) national unity. And this can only happen when we see, appreciate and harness the beauty of our diversity. Thankfully, music is that waiting vehicle that will take us to our destination. Mind you, Nigeria is our collective project. 10. Consistent with the SONIFES tradition of functionality, this year’s edition is designed primarily to promote Nigerians’ diverse cultural heritage, Unity-in-Diversity and peaceful co-existence by means of creative deployment of art forms such as music, drama, dance-drama and a cocktail of other cultural performances, as well as rally a broad spectrum of the Nigerian public to support the President Muhammadu Buhari-led administration in its arduous task of birthing a new Nigeria. 11. The Secretary to the Government of the Federation (SGF), Mr. Boss Mustapha, is the Keynote Speaker and he will be speaking on the topic “THE IMPERATIVE OF HARNESSING THE BEAUTY OF OUR DIVERSITY” whilst the Wife of the First Military Head of State of Nigeria, Her Excellency, Lady (Dr.) Victoria Aguiyi-Ironsi shall preside at the historic event. 12. In furtherance of our commitment to promoting Nigeria’s Unity-in-Diversity, some states of the federation alongside the Chief of Defence Staff (CDS), the Nigerian Television Authority (NTA), Federal Character Commission (FCC), Africa Independent Television (AIT), Nigerian Football Federation (NFF), Channels Television and Federal Radio Corporation of Nigeria (FRCN) have been unanimously nominated for the unprecedented SONIFES 2018 NIGERIA DIVERSITY CHAMPION Award, in recognition of their distinctive roles in promoting national unity and non-discriminatory policies and practices at their respective work places. 13. The purpose of the Awards is to deepen our nation’s Unity-in-Diversity by means of identifying and celebrating institutions whose remarkable efforts, sterling accomplishments and sacrificial service have collapsed the walls of division within their respective domains, as it’s the case with the afore-listed. 14. Another highlight of the festival shall be the formal unveiling of Nigerian People’s Diversity Centre which is conceived to be a lasting monument that attests to our collective resolve to live together in peace as one people by respecting, celebrating and flourishing in our diversity. The Centre will be located here in the nation’s Centre of Unity, Abuja and serve as a functional melting pot for Nigerians of all religions, tribes, languages and cultures. c) Nigerian People’s Diversity Centre. 16. In conclusion, the festival, very much in tune with our prevailing realities, was designed to repel attacks from enemies of the nation, serve as a fitting antidote to the message of hate, fear and division being spread by insurgency, herders/farmers clashes, kidnapping and sundry communal clashes. 17. Please join SONIFES 2018 as we set the tone for national healing through songs indigenous to us. 18. Thank you for listening.